This is the last day! Don't forget to put in your entries for the contest! So you have a wireless network at your home.. you don't need to be 'plugged' in to actually get onto the internet with your laptop, e-reader or tablet. But can others access your wireless system? Maybe your neighbors, or their kids? Well, it does put your own information at risk when your wireless router doesn't have a password. It also could set you up for some nasty legal entanglements if the person using your wireless was (unbeknownst to you) downloading pirated media, like a recent case in Massachusetts. So, you need to be sure your system is secure. If you had to enter a code to link up your computer to the wireless, you are probably all set. Let's see if we can walk you through some of these issues. The easiest thing would be to have the instructions from your wireless router. It would eliminate some of the 'guesswork' as each system can be a little unique. If the answer is no, we can head down to the next step. Find the wireless router brand. It might be Netgear, Linksys, D-link or some other name. We will stick with the more popular versions. Next, on a computer that is connected to the router with a network cable you will need to use your web browser to access the router management system. Use these web addresses to access your wireless system. A box will open asking you for a username and password. If you haven't done this before, try the following: "Admin" as your user name and leave the password blank or "admin" in the Username field, type "password" in the Password field and click "OK."
I highly encourage you to change the password. It does no good to secure your wireless when someone can log in and change your settings or worse, lock you out of your own network! You want to setup your wireless with a strong security (128-bit encryption or higher ) and I suggest WPA (Wi-Fi Protected Access) or WPA2. Older systems may have WEP but this security is no longer strong and can be hacked within minutes. It you don't have the WPA option, you might want to go and upgrade your wireless router. Of course, each screen may be different so it would be difficult to walk you through each step but I can give you some other resources. Used textbooks, fictional books you have read, games that you no longer use and a wide range of other items that take up space can be sold. Most people think about Ebay when it comes to online sales, but if it is sold on Amazon, you can sell your items there as well. Amazon has the Amazon Marketplace, where individuals and businesses sell their items at a fixed price. Amazon sets the shipping costs as well. Once the item is sold, ship it and your funds will be deposited into your bank account. So, the first step is to find out if your item is on Amazon. Make sure you have the correct exact edition or ISBN number. Then look on the right side, down below and find the text "Have one to sell? and the button to "Sell on Amazon". You will need to setup an account, just follow the steps. They will ask for your bank account information so the funds can be directly deposited into your account. Once the account is set, you can submit the item information to Amazon. You will need to set the price. It works best to be competitive. The lower the price, the faster it will, most likely sell If the lowest price is 'fair' condition and I have an item 'like new', I feel a little more confident in asking a higher price. Enter the quantity and then review the shipping. Amazon sets the price on shipping based on the item category, take this into consideration for heavier items. For example, books have a flat rate of $3.99 shipping credit. Shipping Media Mail makes this quite reasonable. If the book fits into a USPS flat rate envelope, I will often offer my college textbooks with expedited shipping (2-6 days) $6.99 shipping credit. I can ship the book for $4.95 using Priority Mail and I always include tracking. Amazon will send you an email once the item sells. You then need to ship it promptly (I suggest the same or next day for the best reviews) and package the item carefully. The information to ship and print the packing slip can be found in your seller account. 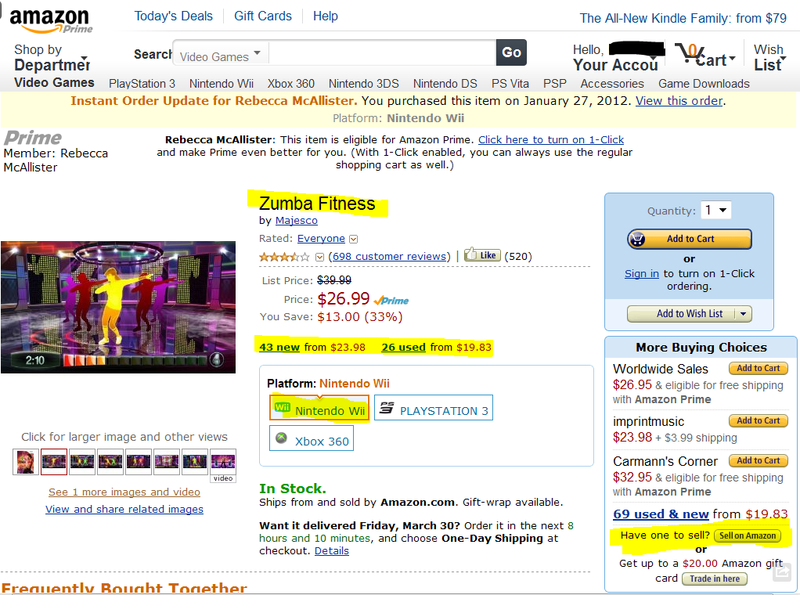 Click on your account at the top right side of Amazon's home page. Then select your "Seller Account" on the right side under "Other Accounts". This is considered "a business" so you may have to deal with returns and refunds if the recipient isn't satisfied, so be careful of your descriptions and shipping. That's it! Check back to your seller account to review your inventory and pricing. Feel free to post any questions on this of anything I might have missed. Click here for more about the Daily Mouse Clicks Giveaway! There are some key points that your children need to know as you allow them to venture onto the Internet. Many times we take these things for granted but kids need your instruction and guidance. 1. Keep password secret. Even my 19 year old recently used our Netflix account on a friend's computer.. DUH! The first rule of Internet safety is: keep passwords secret. 2. When kids use social networks, they are often vulnerable to phishing scams, cyber-bullying, and Internet predators. Teach them never to share personal information and to communicate with you any situation that makes them unsure or uncomfortable. 3. If your kids are blogging, preview what they are writing before they post. They could be providing too much information, putting themselves in danger. 4. Teach them to be wary of things that are too good to be true. Kids are easily scammed and account for 31% of the reported identity theft. 5. Educate yourself and share with your kids. Keep yourself aware of what they are doing online and avoid unsupervised Internet for younger kids and put safeguards, restrictions and parental controls for older children and teens. For more reading check out these sources. DON'T FORGET OUR GIVEAWAY IS STILL TAKING ENTRIES! This new up and rising website star has no visible means of support, contains millions of pictures and receives visits from 10 million people in the U.S. each month. It was listed as one of the The 50 Best Websites of 2011 by Time Magazine. It has received some impressive free media exposure with Reese Witherspoon stating it has "a collection of the most amazing, wonderful craftiness on the earth!" So what is Pinterest? It has been called a visual bulletin board for the Web. People post images of what they love: food, clothing, crafts, books, movies, decorating, travel, photography, videos.. you name it, it's there. Images are called "Pins" and they can be uploaded or with a small application added to your browser, from websites. Once something in "pinned" on Pinterest, you can "Repin" to add it your board. Many of the pins are linked to their original location on the web ( to double click on the full size image), so instructions for that crocheted hat could be available. "Board"? Well that is your virtual bulletin board that contains your pins. You can have several allowing you to organize and categorize your pins. Looking for ideas for a child's birthday party? Use the search feature and find more than you ever expected! Pinterest still requires you to request an invitation, or you can ask someone you know for an invite. Matter of fact.. post your email to me in the comments of this post (I won't publish it) and I will be happy to send you an invite to a fascinating world of images and ideas.